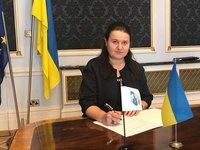 A Ukrainian delegation headed by acting Finance Minister of Ukraine Oksana Markarova starts a road show for the country's eurobonds, which will commence from London and New York, Markarova has said. "Our small TeamUkraine, consisting of the Finance Ministry, Economic Development and Trade Ministry and the NBU [National Bank of Ukraine] divided in London and the smaller Team A is leaving for New York. The flight and several tense working days are ahead," she wrote on her Facebook page late on Monday. She said that the delegation in London will be head by Government Commissioner on Debt Issues Yuriy Butsa.